fically to enhance the characteristics we look for in this style of malt. 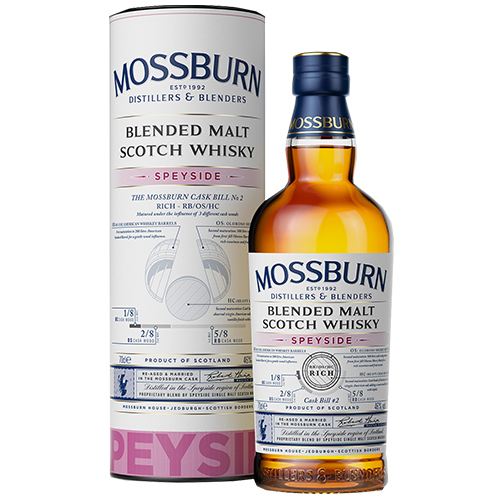 The whisky were first aged in American Oak barrels prior to their initial blending, and were then matured for a second period in our specially coopered custom-made Mossburn Casks. These casks were built to our specifications, with each of the malts having its very own: Cask Bill #1 for the Island and Cask Bill #2 for the Speyside. Cask Bill #2 were specially built Oloroso Sherry Butts with heavily charred virgin American Oak heads which enhance the richness, depth and spicy vanilla flavours. notes coming through as it develops in the glass. Light citrusy spice, white pepper and a touch of exotic fruit come to the front before the sherry influence rolls it all back together again.